A B.C. 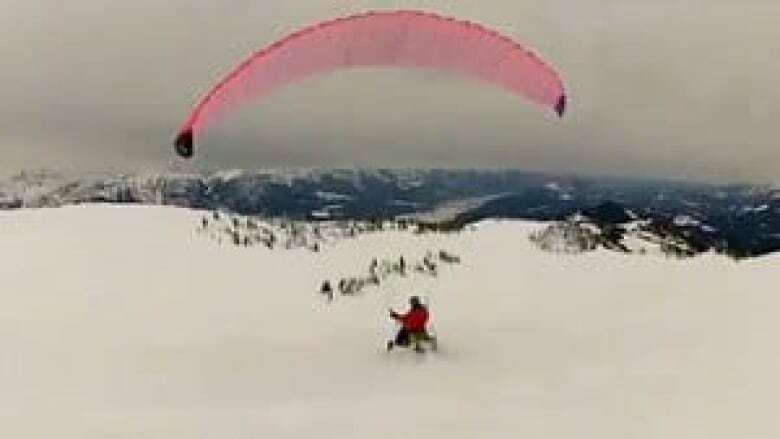 man is pioneering one of the newest extreme sports by combining his love of snowmobiling and paragliding, aiming to launch himself and his sled off the side of a snowy mountain. For the past two years, Eric Oddy has been strapping his snowmobile to his paraglider, gunning the engine for takeoff and launching himself into the air high up in the Purcell Mountains of southeastern B.C. Paragliders are essentially airfoils or wings made from fabric that look a lot like a modern parachute. But just like a plane or a hang-glider, they need speed or wind to actually fly, and that's where the snowmobile comes in. "Many years ago I had my friend launch me off a mountain with a snowmobile… Ever since then I've thought, 'Could we ever fly one of these things?'" says Oddy. And it turns out Oddy can, as he recently demonstrated in a video posted on YouTube called Introducing parasledding with Eric Oddy. "Man, you have to do it to describe it. There is no other feeling like it," says the father of five, who runs a trucking and excavating company in the tiny town of Brisco in the Columbia Valley. Thus far, by strapping his paraglider to his 200-kilogram snowmobile, Oddy says he has flown the rig 30 metres in the air, skimming across the wide open alpine snowfields. But he is far from finished. Oddy, who was once a world-renowned paraglider, is now working on the design of a paraglider that will give him enough lift to one day launch himself further and higher in the air, perhaps right off the side of a mountain. While he admits it may not be for everyone, he thinks his new pursuit can catch on. "You are going to have people who are going to want to do it. I am one of those people who want to do it." And despite comments on YouTube suggesting otherwise, Oddy says the inspiration for the new sport is purely his own. "I've had a lot of comments that it came from a James Bond movie. This idea did not come from no James Bond movie. It totally came up from my own creative ideas."